This happens with people who’ve known me for years. This happens with people who’ve read my book, which I think mentions New Orleans all of two times. So, full disclosure, I was prepared to to scream about this The Daily Beast (motto: “We Have More Standards Than Huffington Post: Two of Them to Be Exact”) story based on the headline alone: “Will New Orleans’ Levees Hold?” But hey a website needs traffic and what better to build traffic than to mash up a current catastrophe with Katrina? People love reading about Katrina. Hell, if the Saints played the Super Bowl in 2020, the network would still be falling all over itself to talk about the comeback after Katrina. 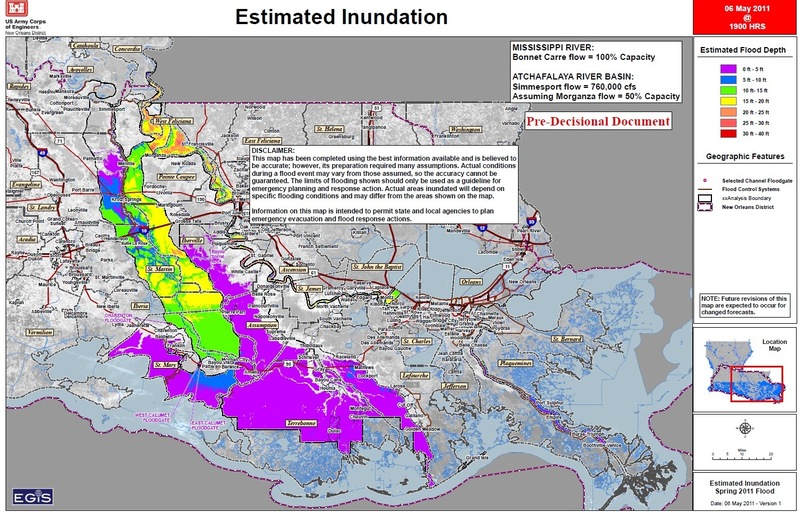 An opened Morganza Spillway will flood parts of seven parishes, as counties are called in Louisiana, to depths ranging from five to 25 feet. The upside: A bumper crop of crawfish is expected as soon as the waters recede. Inevitably, there is much squawking from Morganza Spillway communities about a disaster induced to save New Orleans at their expense. But the static is easily countered, if not quelled, by a recitation of simple fact: The Atchafalaya flood plain would be inundated this year even without opening the spillway. Hey, you river rats, quit your damn squawking. We’re trying to be quirky and what not in New Orleans. We’re what matters in this state, not you! Besides, the flood plain was going to be inundated this year anyway. But as long as there’s a bumper crop of crawfish this year, it’s all good! Listen, people out in the sticks get it. Sacrifices must be made to save urban areas from being destroyed. A lot of people could die if New Orleans floods. And god knows what would happen if the levees around Baton Rouge broke and water rushed into all of those chemical plants. But since they have to sacrifice so that NOLA can go on shooting episodes of Treme and suckering tourists into eating what you call gumbo, the least you could do is show a little respect. *(Good work Google algorithm and the SEO wizards at Daily Beast for landing this story at the top). Next Post Just What IS This Morganza Spillway? wow. WOW. I wish this surprised me really. To so many people, if it ain’t NOLA, it ain’t Louisiana. Yuck.